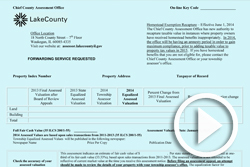 In this episode of Lake County Update, Chief County Assessment Officer Marty Paulson talks about the complex subject of property tax assessments. Get answers to your questions about property tax assessments, including how assessments impact your property tax bill, the appeal process, and how to access helpful resources. Watch Now. Please note: Taxpayers will receive their assessment notice in July or August. The property tax process is outlined in State law, not at the local government level. Visit the Assessor’s Office website at assessor.lakecountyil.gov to review assessment information including property characteristics, comparable property information, and the e-filing process. Property owners will be receiving their blue assessment notices over the next few weeks. It’s important for taxpayers to read and understand this notice. This newsletter will connect you to the resources you will need to help you evaluate your property assessment. * Review all of the information on the assessment notice. * Visit assessor.lakecountyil.gov to review assessment information including property characteristics, comparable property information, and the e-filing process. * Discuss any questions on your assessment value or property information with your township assessor’s office. * If an assessment appeal is in order, prepare evidence by using the Lake County Comparable Grid at assessor.lakecountyil.gov, and other materials such as appraisals, or sales documents. * Complete an assessment appeal form (by paper, or electronically using the e-filing system) and submit with supporting evidence to the Board of Review by the prescribed deadline. * You can attend the hearing in person, by telephone, or submit case materials and ask the Board of Review to decide the case based on the evidence provided. Often, cases can be resolved without an in-person or telephone hearing, particularly cases based upon a recent purchase of a subject property, or those based upon an appraisal provided by an Illinois licensed provider. On-line filing of appeals is available in Lake County. The on-line filing application allows for the uploading of evidence such as the Lake County Comparable Property Grid, an ad valorem appraisal and a legal brief. For cases regarding the recent sale of a subject property, the on-line application requires answering a series of questions about the transaction and allows for the upload of a HUD-1 or Settlement Statement. You will receive an email confirmation that your case has been submitted within one business day of the filing being completed. Once you have received the email confirmation, you can view your submissions on the Board of Review’s Evidence and Schedule portal. It is important to note that the on-line appeal application depends upon the successful operation of many electronic systems, each beyond the control of the Board of Review. Lake County cannot guarantee the availability of the on-line application, and the Board highly recommends appellants not wait until a filing deadline to submit their appeals on-line. Filing deadlines are fixed and not extended if, for some reason, the on-line application is unavailable. The Board of Review has made some changes to its rules and procedures for assessment appeal hearings. One misconception is that a property owner would need to have an attorney to file an assessment appeal. Can a taxpayer still file an assessment appeal? Yes, in nearly all instances a taxpayer can file the assessment appeal without the assistance of an attorney. The county provides a tremendous amount of property assessment related information on the Assessor’s website. The Board of Review has tools that can be used for searching for comparable property information and completing forms on the office website. Corporations and limited liability companies will need to utilize an attorney in the assessment appeal for their properties. Throughout the months of August and September, the Chief County Assessment Office will host a number of Tax Assessment Help Centers. The Help Centers provide one-on-one taxpayer assistance in evaluating property assessments. Help Centers on weekdays will be from 5 p.m. – 8 p.m., and Saturday sessions will be from 9 a.m.-12 p.m.
To be announced, please watch the Chief County Assessment Office website for upcoming dates. Taxpayer advocates will be available at the Chief County Assessment Office Monday – Friday, 8:30 a.m. – 5 p.m.